Expense Keep is the simplest and quickest way to track your expenses. It will save you money and improve your financial health. Expense Keep has been downloaded over 150,000 times and ranked top 5 Finance app in 33 countries. "This is exactly what I was looking for. It has cut my spending tremendously. Couldn't be happier with this app." "I have never rated an app before but I feel so strongly about this app that I knew I had to share with everyone how great it is!" "All I wanted was a sole app to track multiple accounts. This does it. I love it and have deleted all of my other expense tracking apps." "This app is the only budget app that I could find which works well with a zero-based budget." "This is the best budget envelope app available. So beautifully designed and simple to use. Includes recurring transactions and transfers between envelopes." "This app is awesome! Super easy to use without requiring so much personal info like other apps (Mint)." "Finally an expenses tracking app that don't force you to connect every single bank account you have. This app is for those, like me, that like to keep their info as private as possible." 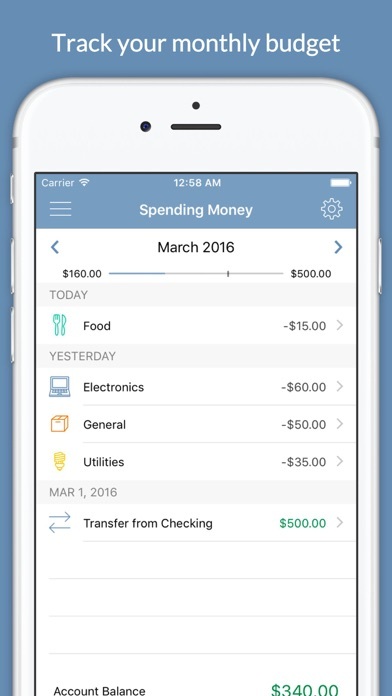 "This app is helping me feel in much more control of my finances." "This app is fantastic. Don't know how i ever managed without it." "Awesome app. Easy to use. Quick to set up and quick to input transactions." "Have tried a number of apps to track expenses, and this one has everything I've been looking for." 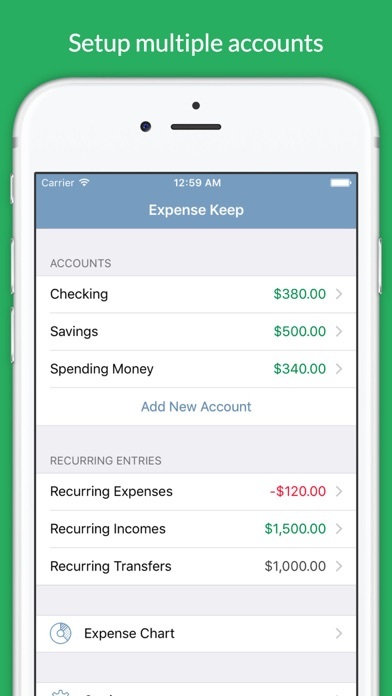 Expense Keep is a personal finance app built to be fast and designed to be flexible yet simple to use. 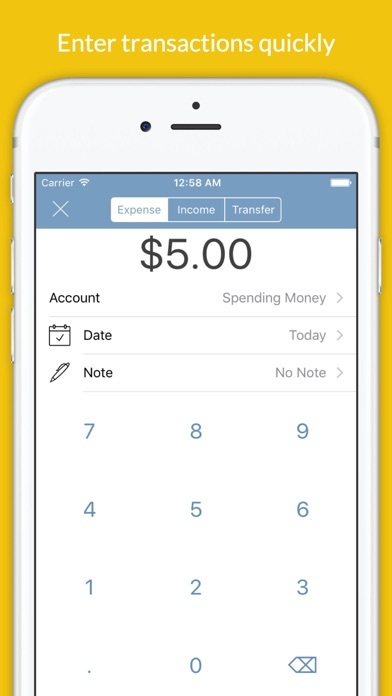 Organize your money into separate accounts and track your expenses and incomes. Accounts can be used to track your bank account balances or as "envelopes" for your different spending groups. FEATURES: Accounts + Add/Edit/Delete accounts. + Set starting balance. + Organize your money into separate accounts. + View current balance of each account. Expenses and Incomes + Add/Edit/Delete entries for expenses and incomes. 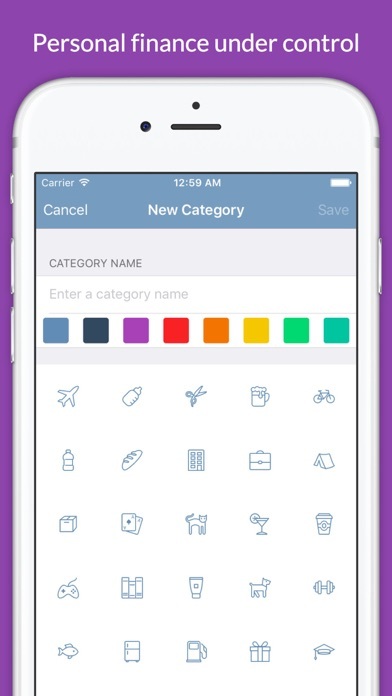 + Create custom expense categories. + Assign expenses/incomes to an account. + Set a date and note for each entry. + Select a category for expenses. Transfers + Add/Edit/Delete transfers. + Transfer money from one account to another. + Helps you stay on budget when you overspend in one account. Recurring Entries + Add/Edit/Delete recurring entries that get automatically entered. + Setup recurring expenses/incomes/transfers for each account. + Set repeat cycles of daily, weekly, biweekly, monthly and more. + Set a start date and end date for recurring expenses. + Or set recurring expenses to be ongoing with no end date. Monthly History + View all entries for current month. + Go back and see previous months' entries. + Go to future months and add entries ahead of time. Cash Flow + See how much you earned/spent for the month. + Cash flow bar chart helps you spend less than you earn. 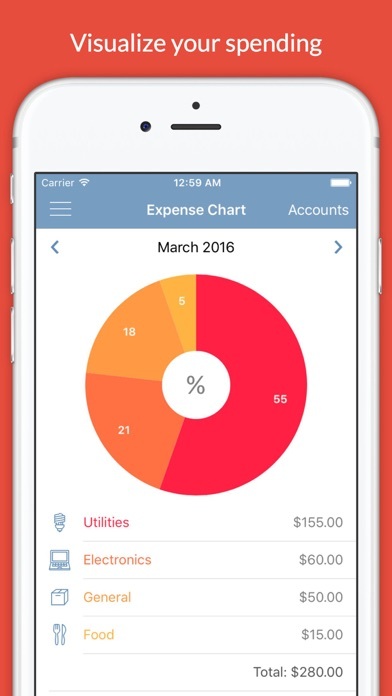 Expense Chart + Pie chart shows your expenses broken down into categories. + See where all your money is going. + Filter pie chart to show only the accounts you select. Report + CSV export Security + Passcode lock feature More features coming soon! Have questions, requests, or feedback? Send them to info@expensekeep.com If you enjoy using Expense Keep or found the app useful, please consider leaving a review. It helps us a lot. Thank you! Just perfect for me. Been using this app since June 2018, and it has helped me track my expenses and manage my spending. Would definitely recommend. I am being charged by the month. Nowhere did the description state the charge was to be monthly. I want these charges stopped. I was searching for a money tracker and decided to give this one a try. After a year, I love it. Very easy to use. Love it. Great app. Easy to use. This app is helpful just wished that it saved all the data so that when i reset my phone i wouldnt have to start all over. Would have given a 5 star if the app had this feature. I’m still in the new phase of using this app. But it’s far easier to use than my previous budgeting app, and I don’t have to create some kind of login account that I see a lot of these types of apps are requiring (which I want nothing to do with). It’s a good basic budgeting app, took off some stars because it said this app would work with family sharing but it doesn’t. Would not have purchased otherwise. Helps me to keep my finances in order and keeps me from having to have several bank accounts. I like this - have used “Spending” in past. This app is so easy to use - immediate input data. My only downfall is that on monthly budget, it does not list each category & the spending individually. A pie chart is provided but not as helpful as the ability to see category specific.